Human nature dictates that students are fascinated by the macabre. Author Adkins give s the people what they want - a Minute steeped in bizarre details that will keep them reading to the very end - and possibly beyond. 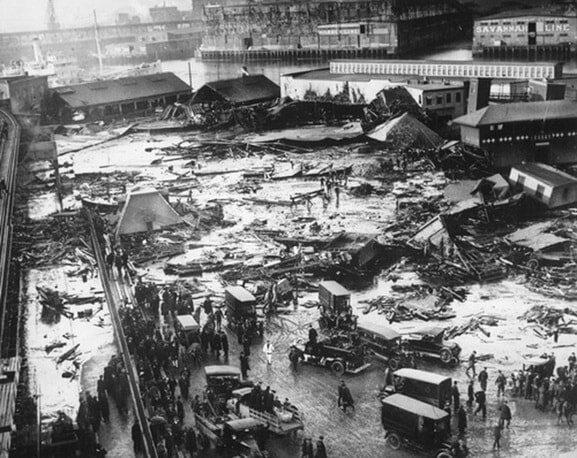 Author Adkins writes that the looming passage of the 18th Amendment to the US COnstitution, prohibiting the sale and use of alcohol, may have been a factor in the quantity of molasses held in the Boston tank. Use this MInute to introduce or review the process of changing, or amending the Constitution. What has to happen? How many times has the Constitution been changed in the past? Is this a necessary feature of a healthy Constitution? Does the practice of amending live up to the intention of the document? Use this Minute to help students learn about weather patterns. What are weather fronts? How do they form? Why do they sometimes “sit” over a geographic location without moving for a few days? What does air pressure have to do with it? What effect does geography and topographical features have on weather? Distillation is a critical process for many consumables other than alcohol production. Desalination requires distillation to make water potable. Use this Minute to teach students how to purify water through distillation, while reviewing the concept of condensation. Government websites, such as the NOAA, the National Weather Service and the EPA, give the public lots of data about temperature and weather patterns over time. Have students explore these sites (domain extension .gov) and see how easy - or difficult - it is to mine the data for analysis. Can they find more easily mined data on the free web by exploring non-governmental sites? Note what is included in each and also what may be missing. Have students talk about the pros and cons of using government sponsored information in research.